Earlier this year, I wrote my master’s thesis about the flame structure in swirl-stabilized industrial gas turbine burners, the role of fuel staging and the effect of the latter on emissions of nitrogen oxides. 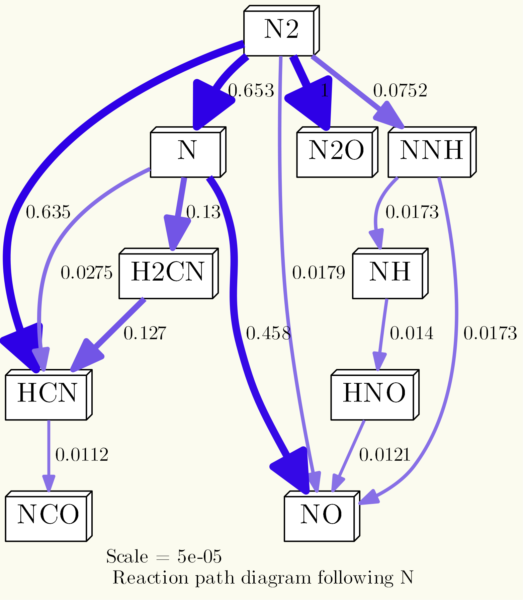 A simulation with cantera and Python was used to determine NOx-levels with changing pressure, temperature and fuel staging. 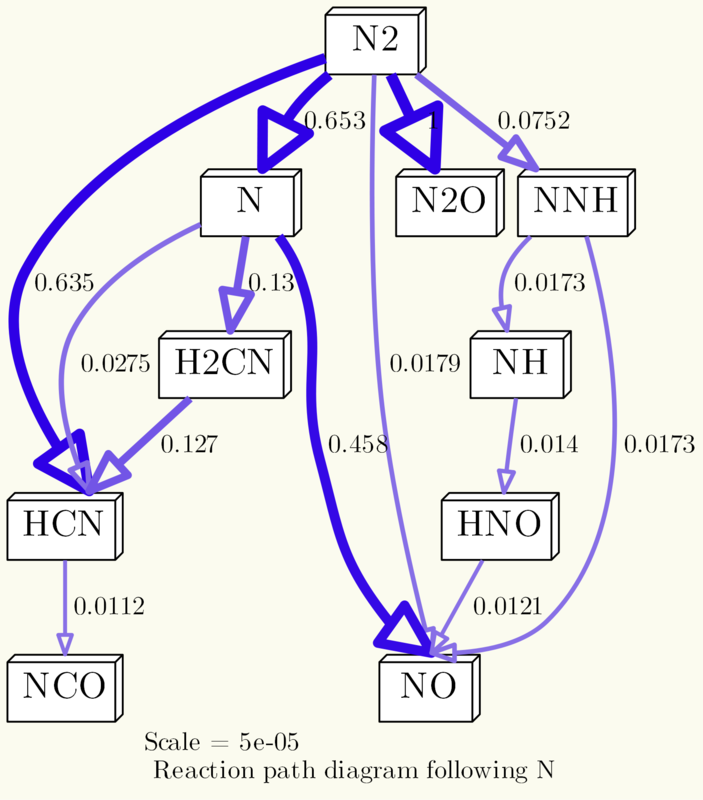 In the course of the work, I needed to generature reaction path diagrams of nitrogen. This feature is included in cantera, but creating those diagrams was harder to achieve than I had anticipated. In part, this was due to misleading or missing documentation of cantera. Not only that, it turned out that cantera simply lacks some essential features here. 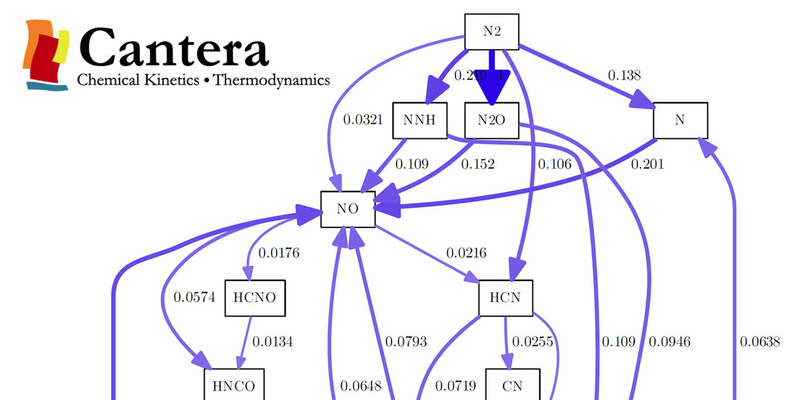 The combination of cantera and the graph visualization tool dot to create those diagrams made it extra confusing, so it took me some time to make cantera and dot do, what I wanted them to do. As it turned out, not a lot of people have the need to create reaction path diagrams, so there were almost no discussions about it in the Cantera Users‘ Group. But it was essential for me. So I tried to work my way around the pitfalls and was eventually able to come up with some nice looking diagrams. For those of you that face the same problem, this article is for you. I have written the code in this tutorial initially for cantera 2.2.1 and Python 3.4. For this article, I updated to cantera 2.3.0 and Python 3.6. There were no changes to the reaction path features of cantera in the latest update, so all the code works for the latest versions, respectively. There might be additions to cantera in newer version, and they may render some of the workarounds obsolete. I will try to update this article, but will not promise anything. I encourage you to an open discussion in the Cantera Users‘ Group or the comments here, where you possibly can help others with your input. Cantera and some other python modules – Find the installation guide here. dot (as a part of graphviz) – Download here. If you are reading this article, you probably came here from a search engine or from the cantera users‘ group. So I assume you already use cantera, that is why I will skip any installation instructions on python or cantera (also, I linked the installation guide above). So let’s start with what you probably don’t already have: dot. Why am I telling you this? Personally, it always helps me if I really know what I am doing, and why I am doing it. 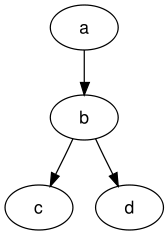 The tool dot that comes with Graphviz is able to understand the notation in the example and can generate graphs like the one above. It is a command line tool that works for Windows, Mac OS and Linux likewise. So, what we are doing is, we use cantera to create the reaction path diagram as dot notation, and after that, we use dot to create the actual diagram. Sounds complicated? It’s not, you’ll see. Cantera will call dot from the command line, so after you installed graphviz, you need to add dot to your system path variables. For windows users, add the path to dot.exe to the system path variables. The dot.exe can be found in the Graphviz program directory in \release\bin\ or \bin\. 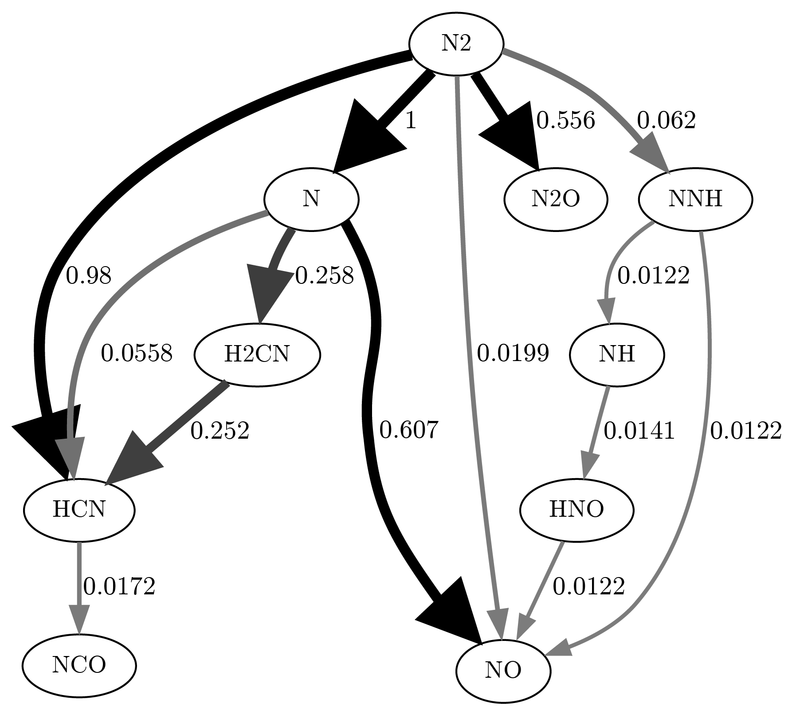 So your path should be something like C:\program files\graphviz-2.38\release\bin\. As you probably added python to your system path variables before, this shouldn’t be an issue. If you don’t know how to set your system path variables, please check this link or this one, that should help you. Written for Python 3.6 with cantera 2.3.0 but might as well work with other versions. # will not undersand the command "dot". # or else you will get errors opening the file later. # The command -Gdpi sets the resolution of the generated image in dpi. s47 -> s37[fontname="Helvetica", style="setlinewidth(5.55)", arrowsize=2.78, color="0.7, 1.05, 0.9"
s47 -> s34[fontname="Helvetica", style="setlinewidth(6)", arrowsize=3, color="0.7, 1.5, 0.9"
That was fairly easy. Now, if you look at the diagram and if you think „that doesn’t look very nice, is there a way to adjust the output?“, I have good and bad news for you. The good news are: There is a way. The bad news: It’s pretty limited, it’s buggy and it won’t do what you expect it to do. So, the next part is for the people like me, that just can’t let it be like it is. The problem about adjusting the outcome in form of the reaction path diagram, is that we are dealing with two different softwares now. There are options available to control the dot file generated by cantera, and there are options to control how dot reads the .dot file and generates the actual image. font Works fine. The name of the font needs to match the name of a system installed font. If you are using Windows and would like to use the Latex font, you should install this font. bold_color Doesn’t do anything. The color, as specified in the dot code as e.g. color="0.7, 1.05, 0.9" (hue, saturation, lightness) is hardcoded in the c++ code of the ReactionPathDiagram export function (if you are interested, see line 342 here). All lines will stay in a blueish color, because hue is hardcoded to 0.7. There were obviously plans to have the user decide the color scheme, but they never saw the light of day. scale Scaling the fluxes. You can, for example, use diagram.scale = -1 (that is also the default value) to have the largest flux scaled to unity. 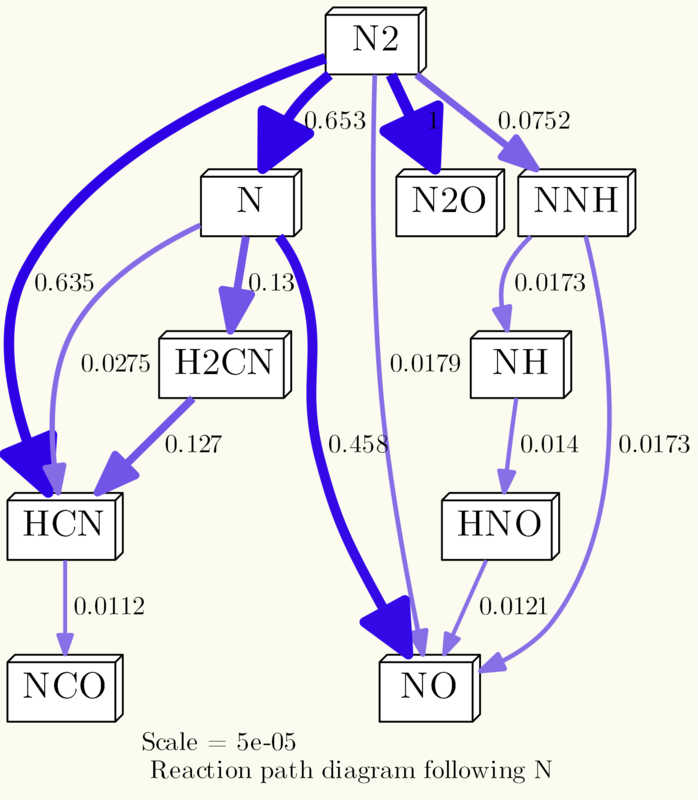 If you use diagram.scale = 1, you get the correct net fluxes, the unit is kmol/m³s. I am mentioning that, because the unit is not in the docs, but I was told that it is kmol/m³s in the cantera user group. If you would like to remove the label with the scale, it’s not possible with cantera, because cantera hardcodes the label in the dot code (Line 366). However, it is possible with some additional work, see further below. title Pretty straight forward, it will print a title in the diagram. The title will be printed at the bottom below the scale notice. 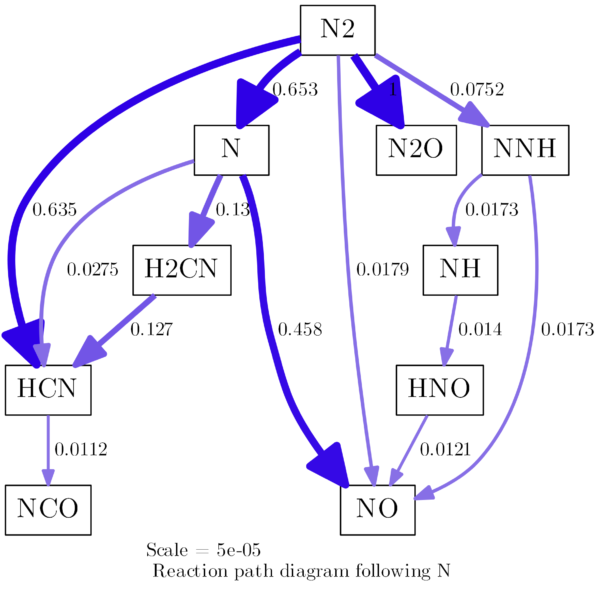 If you are using the reaction path diagrams in a scientific work, I recommend to add a caption there instead. threshold and label_threshold These command are working just fine and they are increadibly helpful to clean up the diagram. E.g. 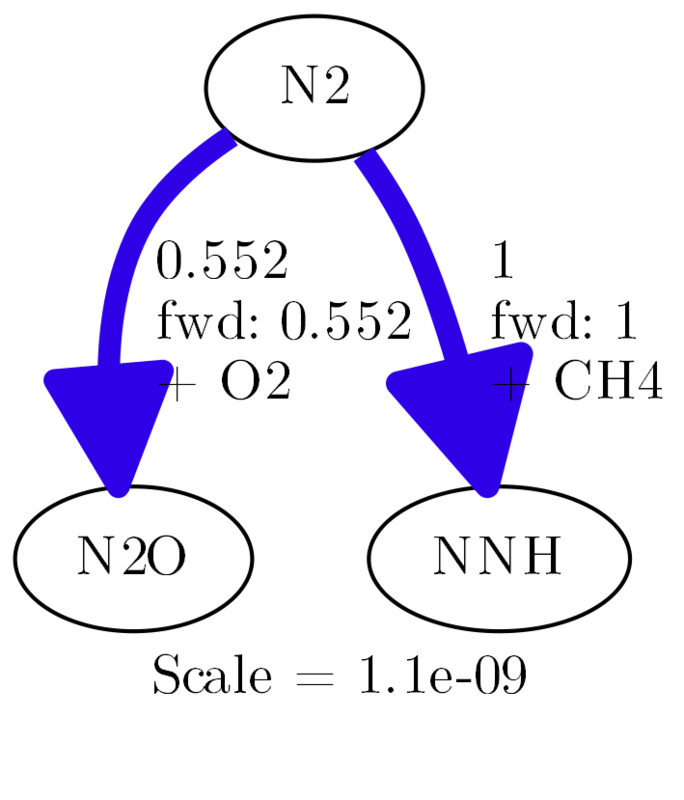 you can set diagram.scale=-1 so that the largest flux is unity. Then you set diagram.threshold=0.05 and all fluxes that are smaller than 5 % of the largest flux are removed. 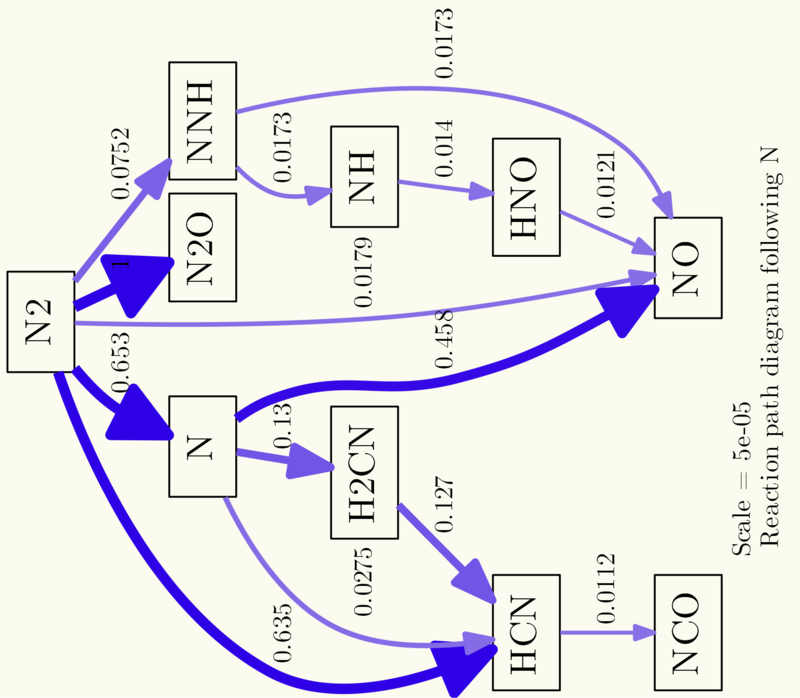 This can help you clean your diagram from irrelevant paths. flow_type Can be either NetFlow or OneWayFlow and it works just fine. Display element fluxes between species both ways or as a summed up net flux. dot_options That is quite an interesting option. It says in the cantera docs „Get/Set options for the ‘dot’ program“. What it does, is, it will take whatever you provide here and put it the first line of your reaction path dot code. For you to understand what this can do, you need to have a look in the documentation or the guide for dot (yay!). I will go into detail below, but to give you an example, diagram.dot_options='node[fontsize=20,shape="box"]' will change the fontsize and the shape of every node in your diagram. write_dot This is the final command, because it is the last one you make. This writes the dot code with all options to your specified location so you can then generate the diagram. As I have shown, some styling is possible with cantera, but not really a lot. You will now understand why I introduced dot in the beginning, because everything else has to come from and has to go into dot code. dot is a powerful tool, so you can style your reaction path diagram in almost every detail, as long as you care to learn a little bit about dot. Some of the possible commands defining the output file type are: -Tps, -Tpdf, -Tsvg and -Tsvgz, -Tpng, -Tgif, -Tjpg. If you kept close attention, you may ask yourself now: „What is the difference between using diagram.dot_options and the command line options?“ Well, there isn’t really one. You can go both ways, but the syntax of the dot_options isn’t as consistent as the command line options, that’s why I don’t like it too much. It is dot’s fault, by the way. 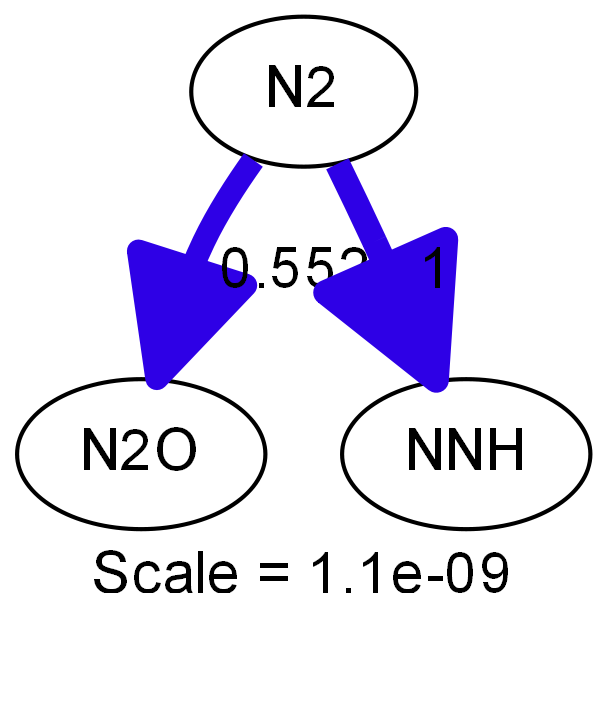 As shown earlier, you can provide options for all nodes like this node[option1=value,option2=value,...]. Same goes for options for all edges with edge[...]. For the graph, however, you cannot use graph[...]. Instead, you just have to call the options without identifier, and seperate them with a semicolons instead of commas. By the way: If you call the same parameter in dot_options and in the command line, the command line will overwrite the settings made in dot_options. That was all fun, but if you start going through all the layout commands and really dive into dot, you will quickly notice that not all of them will work. Some of them won’t work because the combination of commands is illegal. For example, you can set the node style to dotted or dashed (-Nstyle="dashed"), but this will have no effect if the node style is box3d. It works, however, for all the regular shapes like circle, ellipse, box, etc. Another example: The fillcolor parameter for nodes only works if the style is set to filled and has no effect if style is set to dashed, dotted, etc. -Ecolor The line color depends on the size of the flux and is defined by cantera. -Earrowtail For reasons I cannot figure out, it seems not to work to have arrowtails in reaction path diagrams from cantera. -Earrowsize Same as with -Ecolor, the arrow size depends on the flux and is set by cantera. -Estyle Cannot be set to dashed, dotted, etc., because cantera hardcodes a style argument for every edge in the dot file that is used to define the line width. fontname (edges and nodes) The font is set by canteras global font parameter, if not, Helvetica is the default font. In any case, cantera writes the font all over the place in the dot code, so you cannot change it individually for nodes or edges. „But I want to change the edge color no matter what!“ – Okay Cowboy, if you really want to, there is a way. Follow me. That’s it, folks! That is all I know. May this tutorial help you to understand the cantera features better. If you have any questions, just comment below. And if you found this tutorial helpful, please leave a note. It’s always nice to know that it was worth the time. I would like to thank everbody involved in the development of cantera, after all, it’s an incredibly powerful tool. Also, kudos to the people involved in writing dot. So nice to see how open source software makes stuff like this possible. 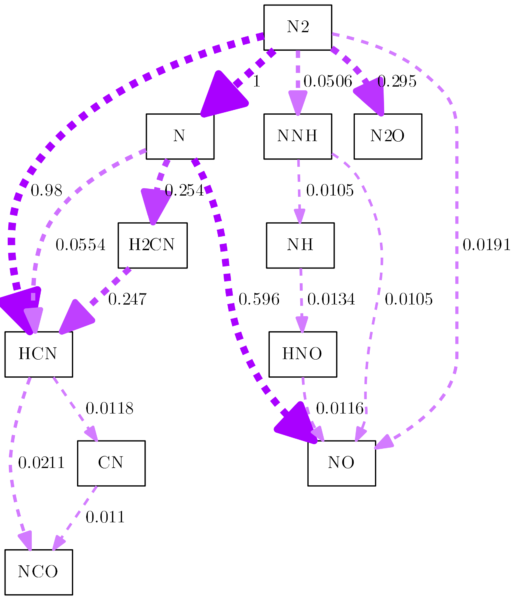 Without dot, there would likely never be a feature to generate reaction path diagrams in cantera. If you find errors in the code, please also comment, so that I can fix them! http://hslpicker.com/ – Color picker for hue, saturation, lightness color values. http://www.graphviz.org/content/attrs#kstyle Docs about the style attribute for dot. The tutorial is very helpful. Thanks to you. 1. Is it possible to write a loop in concentration terms rather than in temperature? 2. It is unclear in regard to what concentration the reaction path analysis is carried out? I am not sure if I understand what you mean. The reaction path analysis is carried out in terms of kmol/m³s of species forming or dissipating. The concentration before the reaction is set by yourself and it can be monitored while the reaction takes place. You can write loops for any value that you can monitor, so yes, you could write a loop for concentration, too. The loop used in the example is just arbitrary to have some reaction taking place, the focus here was on the reaction path. Thank you for a very clear and detailed tutorial! I am just starting to dabble into Cantera and I was drawn to it primarily due to this reaction network capability for use in microkinetic modeling. Tutorial is great! I am implementing some of your tips in my Cantera based parametric PFR with approximate heat transfer to provide an automatic reaction path at each discrete position. Please let me know if you wish to receive the final code. I am not actively working with cantera at the moment, but there may be other that could be interested in your solution. 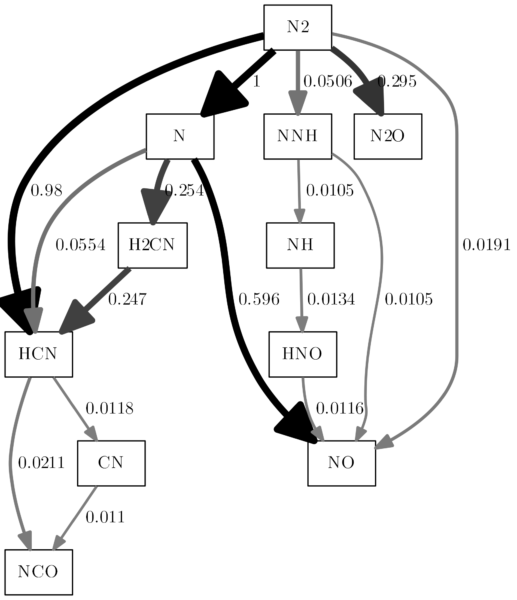 During my master thesis I discussed with my colleague if it is possible to generate reaction path diagrams in fine steps that you not only have the current net flows but sum it up to the total flows over a certain period of time. What you are doing may lead to such a solution, that would definitely something people are interested in. The tutorial is of great help. I’m wondering if you also know how to output a species‘ production rate and/destruction rate with respect to the reactions that consuming or producing it. If your have not idea on it. Thank you all the same. this is an amazing tutorial and very useful for all of us, students and researchers, using cantera. Thank you so much for sharing and for your effort.